Powered by Apostle MiniMaxTM technology, Apostle MiniMaxTM cfDNA Blood Collection Tube (BCT) is an excellent tool for blood cfDNA preservation during blood collection, storage and transport. Prevent the release and contamination of genomic DNA from cells in blood during storage and transportation. Preserve existing cfDNA in blood from degradation. Prevent existing cfDNA in blood from cross-linking with with other biomolecules (i.e. protein). Storage of blood in regular EDTA tubes results in the release of significant amount of genomic DNA (Exhibit 1). The genomic DNA contamination will significantly reduce the sensitivity and accuracy of cfDNA analysis. Therefore, prevent genomic DNA contamination is one key issue in blood cfDNA preservation. Exhibit 1. Storage of blood in EDTA tubes results in significant genomic DNA release. 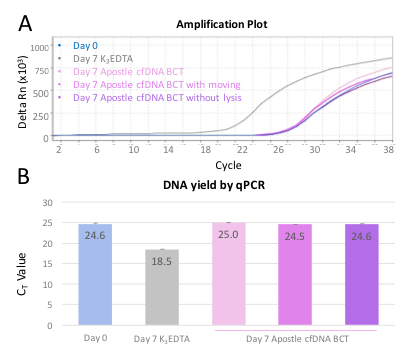 Compared to samples processed immediately after collection (blue curve), significant amount of genomic DNA contamination from cells was observed in K3EDTA tube after 7 days (red curve). K3EDTA BCTs are not suitable for blood storage and transportation in cfDNA based applications. Apostle MiniMaxTM cfDNA BCT minimizes genomic DNA release during blood storage (Exhibit 2A) and transportation (Exhibit 2B) for at least 7 days. Minimum genomic DNA contamination leads to accurate and sensitive cfDNA analysis. Though competitor product also has the ability to prevent genomic DNA release, its chemistry causes crosslinking of DNA to other biomolecules, leading to size increase and a peak shift from 170bp to 200bp (Exhibit 2). This crosslinking caused by competitor’s product will affect subsequent application of isolated cfDNA. On the other hand, cfDNA preserved with Apostle MiniMaxTM cfDNA BCT for 7 days shows no peak shift compared with cfDNA isolated immediately after blood collection (Exhibit 2), demonstrating high cfDNA quality preserved by Apostle MiniMaxTM cfDNA BCT. Exhibit 2. Apostle MiniMaxTM cfDNA BCT minimizes genomic DNA contamination during blood storage. Blood was drawn into regular EDTA tube, Apostle MiniMaxTM cfDNA BCT, and a competitor’s cfDNA blood collection tube. Blood drawn in EDTA tube was processed immediately with cfDNA isolation (Day 0 reference). Blood drawn into Apostle MiniMaxTM cfDNA BCT and competitor’s tube were stored (A) or subject to transportation (B) for 7 days. After 7days, blood from these tubes were processed with cfDNA isolation. (A) >90% cfDNA were recovered from samples collected in Apostle MiniMaxTM cfDNA BCT (red curve), as compared with day 0 reference (blue curve). On the other hand, blood collected in competitor’s product resulted in a peak shift of isolated cfDNA from 170 bp to 200 bp (green). Minimal genomic DNA contamination was observed for blood stored in Apostle MiniMaxTM cfDNA BCT for 7 days. (B) Same conclusion was drawn as in (A), Subject the samples collected in Apostle MiniMaxTM cfDNA BCT to moving conditions for 7 days doesn’t result in any release of genomic DNA (red curve), comparing with day 0 reference (blue curve). During cfDNA isolation process, according to various cfDNA isolation protocols, the proteinase K treatment of plasma can always be skipped for blood collected in EDTA tubes. However, proteinase K treatment is required for blood collected in competitor’s cfDNA blood collection tube, or no cfDNA can be isolated (Exhibit 3A). This is another evidence showing the crosslinking of cfDNA with other biomolecules during blood storage in competitor’s blood collection tube. On the other hands, cfDNA isolated from blood collected in Apostle MiniMaxTM cfDNA BCT does not require proteinase K treatment, and has the right peak at ~170 bp (Exhibit 3B), demonstrating minimal crosslinking for cfDNA preserved with Apostle MiniMaxTM cfDNA BCT. Exhibit 3. Apostle MiniMaxTM cfDNA BCT minimizes cfDNA crosslinking with other biomolecules during blood storage. (A) cfDNA was isolated from blood stored in competitor cfDNA blood collection tubes for 7 days, with or without the proteinase K lysis step. 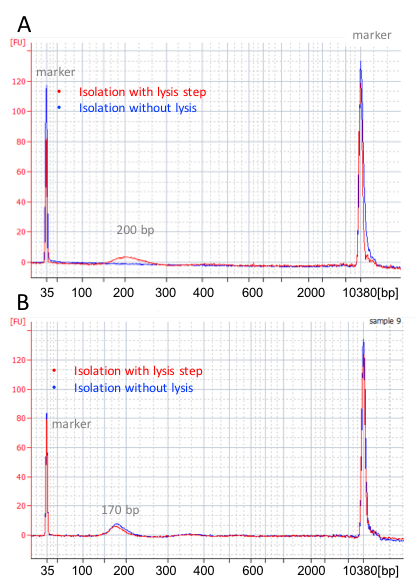 Proteinase K lysis step is required to isolate cfDNA from blood samples collected in a competitor’s cfDNA blood collection tube (red curve), or no cfDNA could be isolated (blue curve). The peak of cfDNA isolated from competitor’s cfDNA BCT also shifted from 170bp to 200bp after 7 days storage. (B) cfDNA was isolated from blood stored in Apostle MiniMaxTM cfDNA BCT for 7 days, with or without the proteinase K lysis step. Minimal difference was observed for cfDNA samples isolated from Apostle cfDNA BCT with (red curve) or without (blue curve) proteinase K lysis step. qPCR measurement for beta-globin expression of isolated cfDNA were also performed as a mean to reflect cfDNA preservation in Apostle MiniMaxTM cfDNA BCT. 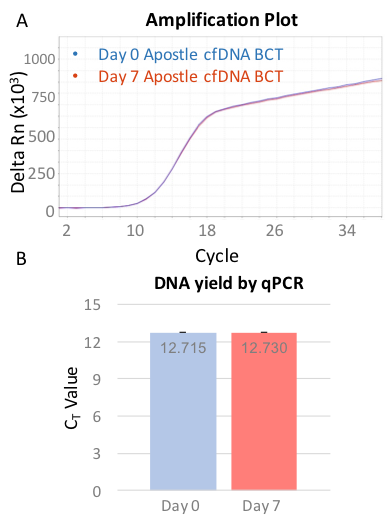 After 7 days storage or transportation, beta-globin expression of isolated cfDNA share the same CT value with cfDNA isolated immediately after blood drawn in EDTA tubes (Exhibit 4), demonstrating high endogenous cfDNA recovery and quality of blood collected in Apostle MiniMaxTM cfDNA BCT. Exhibit 4. High endogenous cfDNA recovery and quality of blood collected in Apostle MiniMaxTM cfDNA BCT. 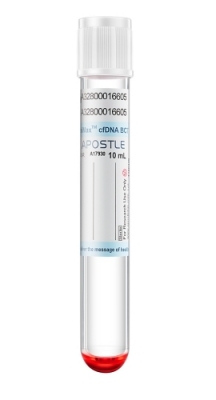 Fresh blood samples were collected in EDTA tubes, Apostle MiniMaxTM cfDNA BCTs at the same time, and stored at room temperature for 7 days before cfDNA isolation. A reference cfDNA sample was prepared through cfDNA isolation from plasma prepared immediately after blood drawn in EDTA tube on day 0. The isolated cfDNA was amplified for beta-globin expression by qPCR. Amplification plot and CT value were consistent among Day 0 reference and Apostle MiniMaxTM cfDNA BCT, stored standstill or subject to transportation, with or without proteinase K lysis step. Due to genomic DNA contamination, Beta-globin expression of isolated cfDNA from blood stored in EDTA tubes for 7 days showed much lower CT value. Spike in and recover experiment was performed to further validate cfDNA recovery rate of blood stored in Apostle MiniMaxTM cfDNA BCT. DNA fragment containing the EGFR c.2573T>G L858R mutation (synthetic, ~170 bp) was spiked into blood in Apostle MiniMaxTM cfDNA BCTs, and recovered after 7 days storage. qPCR measurement for EGFR c.2573T>G L858R mutation expression showed no obvious difference after 7 days storage. 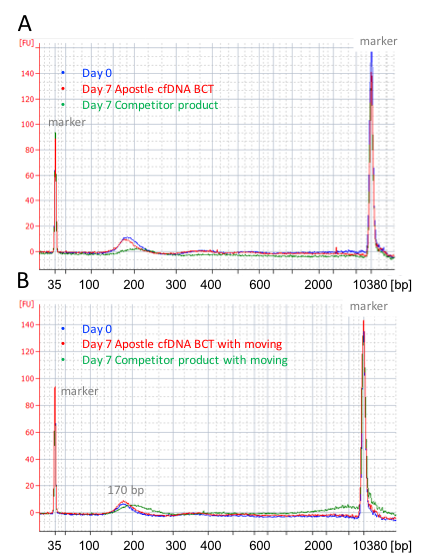 According to CT value, 99% of spiked in DNA was recovered, demonstrating high stability of DNA preserved with Apostle MiniMaxTM cfDNA BCT (Exhibit 5). Exhibit 5. High exogenous cfDNA recovery and quality of blood collected in Apostle MiniMaxTM cfDNA BCT. Fresh blood sample from the same individual was collected in multiple Apostle MiniMaxTM cfDNA BCTs and 100 uL of DNA fragment containing the EGFR c.2573T>G L858R mutation (synthetic, ~170 bp) with concentration of 0.01 ng/uL, was spiked into the BCTs. Blood in one Apostle MiniMaxTM cfDNA BCT was processed immediately (Day 0 reference), and the other Apostle MiniMaxTM cfDNA BCTs was stored at room temperature for 7 days, until cfDNA was isolated (Day 7). The isolated cfDNA was then amplified for EGFR c.2573T>G L858R mutation expression by qPCR. Amplification plot and CT value were consistent between Day 0 reference and cfDNA isolated from Apostle cfDNA BCT on day 7. In summary, high cfDNA quality can be preserved with Apostle MiniMaxTM cfDNA Blood Collection Tube for downstream applications, through the prevention of cfDNA degradation, crosslingking and contamination.